Lorenzo LaVonne Neal (born December 27, 1970) is a former American football fullback who played in the National Football League (NFL) for sixteen seasons. Neal played college football for Fresno State University. He was drafted by the New Orleans Saints in the fourth round of the 1993 NFL Draft. A four-time Pro Bowl selection and three-time All-Pro, he was also a member of the New York Jets, Tampa Bay Buccaneers, Tennessee Titans, Cincinnati Bengals, San Diego Chargers, Baltimore Ravens, and Oakland Raiders. Considered one of the best blocking fullbacks in NFL history, Neal blocked for a 1,000+ yard running back in eleven straight seasons from 1997 to 2007. Neal attended Lemoore High School in Lemoore, California and was a letterman in football and wrestling. He set many rushing records for the Tigers football team with over 2,000 yards in rushing in a season, which would later be broken by Nick Sula. In wrestling, he won a state championship as a senior. Neal still owns the California state record for fastest pin in a match against Michael Weisser. Neal attended Fresno State University, where he played for the Fresno State Bulldogs football team from 1989 to 1992. During his four college seasons, he rushed for 2,405 yards. He was an All-Big West selection his junior and senior seasons. He also placed seventh, earning All-American honors at the 1992 NCAA wrestling tournament in the 275 lb (125 kg). heavyweight class. Neal finished his career as the school’s second-leading rusher with 2,405 yards and played in the Japan Bowl All-Star Game. He defeated a sumo wrestler in an exhibition match in Japan during the Japan Bowl. He graduated with a degree in criminal justice. In 1991, he ran for 837 yards and 8 touchdowns. In 1992, he ran for 988 yards and 10 touchdowns. 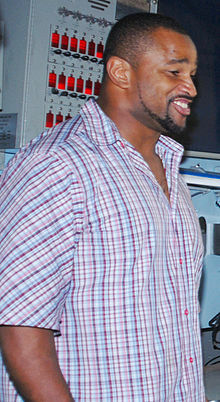 In 1997, Neal signed with the New York Jets, on March 31. In his one season with the team, he helped running back Adrian Murrell rush for 1,086 yards. In 2000, Neal helped George rush for 1,509 yards and 14 touchdowns. Neal was named the "NFL's Best Blocking Fullback" by the Sporting News. He was also named to Sports Illustrated's midseason All-Pro team. He was also named a Pro Bowl third-alternate. He was released by the Titans on March 1, 2001. After two seasons with the Titans, and one Super Bowl appearance, Neal signed with the Cincinnati Bengals on May 8, 2001, where in his first season with the team, he helped Corey Dillon rush for 1,315 yards. After the season, Neal was named to USA Today's All-Joe team. He was also selected as a Pro Bowl second-alternate. In 2006, Neal helped Tomlinson and Michael Turner record 194-rushing yards for the September 11 season opening 27–0 win in Oakland. The Chargers scored two rushing touchdowns, one by Tomlinson and one by Turner. Neal helped block for a 241-rushing yard performance against the Titans in a 40–7 Week 2 win, which included two Tomlinson rushing touchdowns. On October 15, during a road game against the San Francisco 49ers, Neal helped Tomlinson tie a team record and set a career-high with four rushing touchdowns. In the Chargers 35–27 win over the Browns on November 5, Neal played in his 200th-consecutive game and helped the Chargers rush for 190 yards and three touchdowns. During November 19, 35–27 Chargers win, he helped Tomlinson rush for 105 yards and three touchdowns, which put Tomlinson over 1,000 yards for season, marking the 10th-straight year Neal was the lead blocker for a 1,000-yard rusher. He scored his first touchdown of the season against the Denver Broncos on December 10, on four-yard trick play run called the “Bumarooski” late in first quarter, it was his first rushing touchdown since September 28, 2003 at Oakland and gave the Chargers a 14–0 lead. He also threw a key block on Kansas City Chiefs Linebacker Kendrell Bell that helped Tomlinson run for a career-long 85-yard touchdown on December 17, it was the third-longest run in team history. Neal also helped contribute to the Chargers recording 265 rushing yards, fifth-most in team history. He was named to his third Pro Bowl and was a First-team All-Pro selection by the Associated Press, USA Today, Sports Weekly and ESPN.com. In 2007, Neal had his streak of 221 consecutive games played come to an end when he was inactive for Week 14 against the Detroit Lions, while he recovered from a broken leg suffered the previous week against the Titans; he had not missed a game since 1994. Against the Chiefs, he helped Tomlinson surpass 1,000 yards, marking the 11th-straight season as the lead blocker for a 1,000 yard rusher. Neal recorded a touchdown reception on a fourth-and-goal play in Week 2 on the road against the New England Patriots, (his first touchdown reception since 2005). He was named to his fourth Pro Bowl and was named First-team All-Pro by the Associated Press and All-NFL by USA Today and Sports Weekly. On February 28, 2008, Neal was waived by San Diego. On August 12, 2008, the Baltimore Ravens signed Neal to a one-year contract. Neal was signed by the Oakland Raiders on May 8, 2009. He was waived/injured on August 19 to make room for safety Rashad Baker and subsequently reverted to injured reserve. He was released by the Raiders with an injury settlement on August 26. He was expected to push Oren O'Neal and Luke Lawton for the starting fullback job. In September 2009, Neal was selected to the Sporting News Magazine's Team of the Decade for the 2000s. There is currently a movement by fans and former NFL players to get Neal inducted into the Pro Football Hall of Fame based on his role creating so many +1,000 yard seasons for featured running backs. Neal and Ray Oldhafer, long time cohort of Adam Carolla, started the NFL Podcast "Ray and Lorenzo" under Carolla Digital, which was launched on September 6, 2013. He is now a co-host on the morning show Mornings with Joe, Lo, and Dibs on San Francisco radio station 95.7 The Game. ^ Neal appearance on NFL Network in 2007. ^ "Lorenzo Neal Stats". ESPN Internet Ventures. Retrieved June 5, 2014.